One Amber is a freehold condominium project located along Amber Gardens. Comprising of four 23-storey residential towers with 562 luxuriously appointed apartments, One Amber is crafted with a variety of landscaping and recreational facilities creating a sense of belonging and a warm conducive living environment. One Amber promises a complete lifestyle with its full recreational facilities. Stroll across the magnificent landscaped gardens, tan on the pool deck or relax in the tranquillity of the reflective ponds and Jacuzzi, lounge around the sprawling pool or keep in shape at the fitness stations and gymnasium. One Amber boast carefully designed elegant interiors to make an intimate home. Large floor to ceiling windows allowing natural light to illuminate each apartment and spacious balconies allow for alfresco dining under the moonlight. Bathrooms stylishly appointed with the latest sanitary fixtures and plush modern wardrobes in the bedrooms ensure that you can feel truly pampered in your very own spacious sanctuary. One Amber is conveniently located in the popular East Coast / Katong residential district, it is within close proximity to amenities including top schools, nostalgic conservation shops along Katong, trendy gourmet bistros, shopping malls and the idyllic East Coast Park. One Amber is also well-served by major expressways including the East Coast Parkway (ECP) and Pan Island Expressway (PIE). It takes a 15-minute drive to Changi Airport and about 7 minutes to the Central Business District (CBD) via the East Coast Parkway (ECP) or Nicoll Highway. One Amber is convenient location to live, with three 'S" that is Sun, Send and Sea. Close to CBD, Air port and East Coast Park. Surrounded by Good Local Schools and Int'l School like Canadian Int'l School. Good Shopping Mall like Paraway Parade, I12 Katong, and Katong Shopping Centre. Delicious Food like Famous Katong Laksa etc. Great place, great location, great ambience .... Indeed a solace to be home at One Amber. 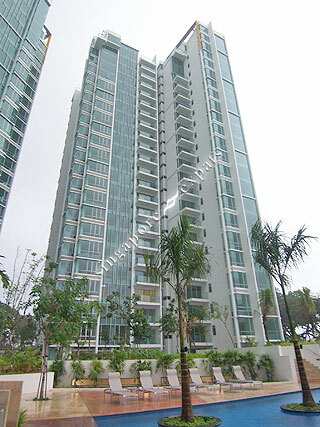 One Amber Superb Location, New Devlopment with Full condo Facilities and beaufiul land scaping.